One of the best ways to keep healthy is to eat a diet rich in whole foods. However, there are a few vitamins and minerals that can be typically low when following a plant-based diet. It’s a good idea to get blood work done by your healthcare provider at least once a year to make sure your levels are up to par. Often, people may not even know they are deficient until they start experiencing symptoms later on. If you are low, you can get your levels back on track through diet and supplements. While you can get a blood test for B12, a better marker for deficiency methylmalonic acid (an organic acid which can be tested in urine). If MMA is high, it indicates a true B12 deficiency. There are no naturally occurring plant-based foods that contain B12, however, some foods (like nutritional yeast) are fortified with them. It is essential for vegans to get enough B12 so while it may be possible to get the amount needed through fortified foods, it’s easier to take a supplement and be sure you are getting adequate amounts of B12. Methylcobalamin and cynocobolamin are two absorbable types of B12. I myself take 1000mcg/day of a sublingual methylcobalamin but be sure to check with your personal nutritionist or healthcare provider for the correct kind for you especially if you have any issues with methylation. Bloodwork will test 25 OH D levels. If levels are low, which many times they are for vegans especially in the winter because vitamin D is synthesized by the sun, you can take a supplement to get them back up to normal. Once normalized, supplements can be re-evaluated with your nutritionist or doctor. Plant-based food sources of Vit D: There are not many naturally occurring foods with Vitamin D except for mushrooms if they have been treated with UV rays. Some fortified foods like some non-dairy yogurt and milk, orange juice, cereals, and tofu contain vitamin D – just be sure to check the packaging. Much of our population is low in vitamin D, especially in the winter months. I myself take 1000IU/day to keep my levels up. Before starting on any supplementation, be sure to check your vitamin D levels and talk with your personal nutritionist or healthcare provider. If you do supplement with vitamin D and are vegan, be sure to note that most vitamin D3 is animal-based while vitamin D2 is plant-based. There is no real test for calcium deficiency because your body tightly regulates calcium levels. If you are low in calcium, your body will take it from your bones so you want to make sure you’re getting enough calcium in your diet to prevent osteoporosis. Plant-based food sources of Calcium: leafy greens (kale, turnip greens, mustard greens) fortified soy and other nondairy milk, fortified tofu, white beans, bok choy, broccoli, and watercress. You can also supplement with calcium to ensure you are getting enough to maintain your levels but check with your personal nutritionist or healthcare provider if you have questions on that. Many vegans are low in iron because many sources of iron are meat-based. You can get a full iron panel done which includes iron and Total Iron Binding Capacity (TIBC), ferritin, and transferrin blood tests. It’s good to get these checked every once in a while to make sure levels are adequate and to prevent iron deficiency anemia. Plant-based food sources of Iron: lentils, carrots, soybeans, broccoli, oatmeal, quinoa, fortified cereals. For better iron absorption, eat foods high in iron with vitamin C rich foods. Absorption can be decreased when taken with tea or coffee. For better iron absorption, eat foods high in iron with vitamin C rich foods. Absorption can be decreased when taken with tea or coffee. Plant-based food sources of Zinc: lentils, green peas, white beans, wheat bran, corn, oatmeal. Zinc supplementation is sometimes necessary for vegans. I myself supplement sometimes, especially during cold and flu season. Speak to your be sure to your personal nutritionist or healthcare provider on supplement details. Great post, thanks. I keep most of these on hand and the more I learn, the more I think most people, no matter what their diet is, should be taking a lot of these. Yes, totally Christine. So many people are low in all of these. Most people over 50 should probably be taking B12 because the older we get the harder it is to absorb. I have my parents and aunts and uncles all on b12. This is great info! I take a few supplements, but it’s good to know what foods these essential nutrients are in. Thanks Amy! It’s always great to get nutrients from food if we can but supplementing can really help too. This is a great list! I just had blood work done, and I was surprised to find that my B12 levels were super high! I’ve actually been taking too much! Thanks so much Dianne. Oh wow, that’s a switch – most vegans are low! So happy to see zinc on the list! I will randomly track my nutrition and zinc always lags behind. 🙁 I think most vegans think twice about it. Yes, zinc is one of those that many people don’t think about but has so many functions in the body. My zinc is often low so I take supplements sometimes to get my levels back up. This is a great summary. I confess I forgot about zinc! I am aware of the others and try to supplement them periodically but that is one I overlook. Thanks, Kari! Zinc is often overlooked. I did for the longest time till I realized I don’t get enough so I supplement sometimes. Lots of great info here, thanks for sharing this! Vitamin D is especially important because of where I live and the lack of sun for a good chunk of the year! Thanks Gwen! Yes, Vit D for everyone in the winter (especially where you are) is so important. Great info here! I have to take B12, D and Iron, but ironically I was low in all of those even when I ate meat! Yes, I think a lot of people (vegan or omni) are low in many of these. 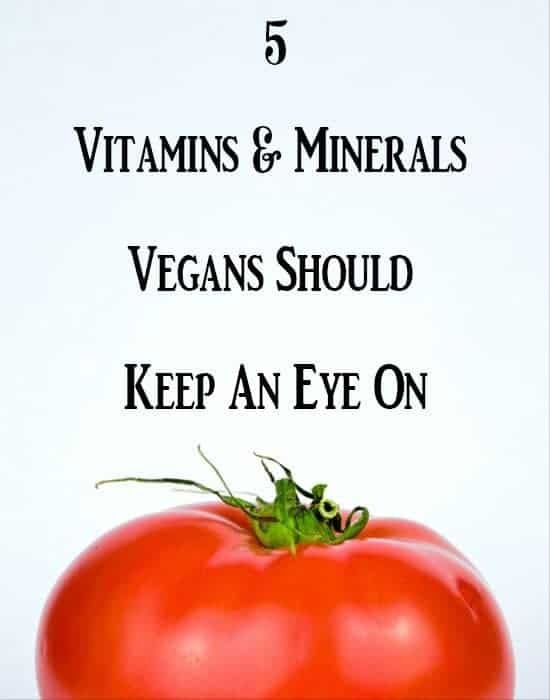 Great post for anyone starting out on a vegan diet! Thanks for sharing this information.